Velikost predogleda: 800 × 600 točk. Druge ločljivosti: 320 × 240 točk | 640 × 480 točk | 1.024 × 768 točk | 1.280 × 960 točk | 2.948 × 2.211 točk. The dead woman, her name inscribed on the base of her chest, was clearly a well-to-do lady. She reclines upon a mattress and pillow, holding an open-lidded mirror in her left hand and raising her right hand to adjust her mantle. 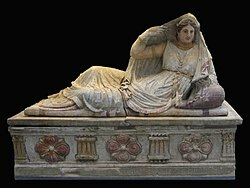 She wears a tunic (chiton) with high girdle and a bordered cloa, and her jewellery comprises a tiara, earrings, necklace, bracelets and finger-rings. 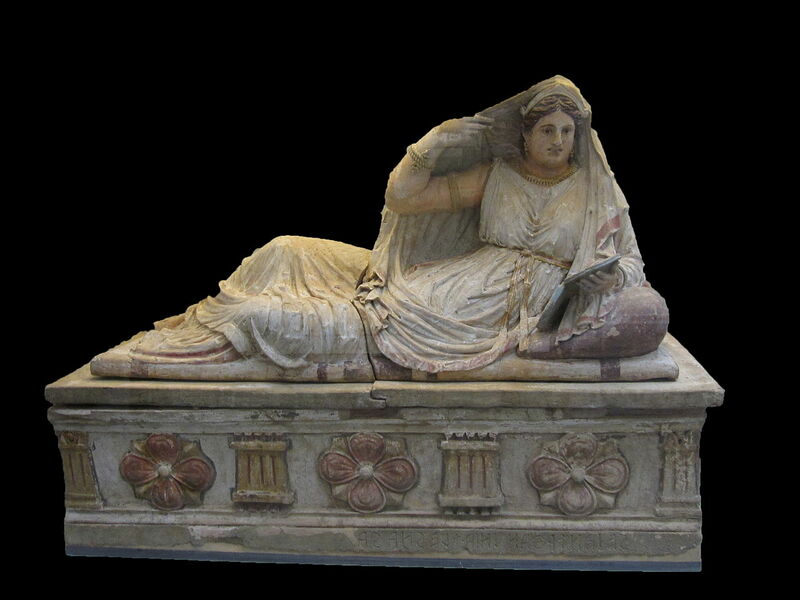 The skeleton from the sarcophagus was found to belong to a woman who was about fifty years old at the time of her death. Datum ok. leta 150 do 140 pr. n. št. Place of discovery: Poggio Cantarello, Chiusi. 1887 : purchased by British Museum from Wolfgang Helbig. Ta slika je digitalno obdelana. Napravljene so bile naslednje spremembe: made background black. Izvirnik je na razpolago tukaj: British Museum Etruscan 8.jpg. Spremembe je napravil uporabnik Ophelia.summers.